MSM is an organic form of naturally-occurring sulfur. MSMPure is OptiMSM which is the world's purest and safest MSM (MethylsulfonylMethane). Our MSM goes through a multi-stage distillation process to ensure a 99.9% pure product to guarantee a consistent, high-quality form of MSM. MSMPure is manufactured in a GMP-FDA approved facility and 3rd-party tested to the industry's tightest purity specifications. The fine powder powder is great for dissolving quickly in water, juice, smoothies or shakes. The 1 lb size is roughly a 60 day supply based on taking 8 grams daily. 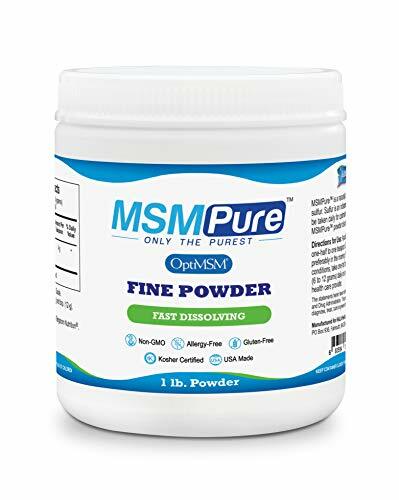 WHY MSMPure POWDER? We only use Optimsm which is "the purest MSM on the Planet" and the only MSM made in the USA. Our MSM is the organic form of naturally occurring Sulfur. MSMPure goes through a propriety multi-stage distillation process that ensures a 99.9% pure, third party tested to meet our stringent product specifications. This is the only GRAS-designated, Kosher & Halal certified, non-GMO, gluten-free, allergen-free, non-shellfish-derived, vegan MSM backed by extensive toxicology data. WHAT ARE MSMPure BENEFITS TO JOINTS? Improves joint function and mobility, Reduces joint pain and stiffness, Increases range of motion, Protects cartilage, Decreases swelling and inflammation, Aids in short term recovery by reducing inflammatory responses and swelling involved in joint pain and fatigue. MSMPure IS COMMONLY USED NATURALLY FOR MEN AND WOMEN WITH: Aids and supports any of the following joints or ligaments: shoulder, hands, fingers, wrist, ankles, heel, knees, hip, lumbar or lower back or foot. MSMPure ADDITIONAL BENEFITS: Known as "Nature's Beauty Mineral" for faster hair growth, promote nail growth, improve skin texture, younger looking skin, may reduce fine lines and wrinkles, restores collagen production and acne improvement. The MSMPure GUARANTEE: No-Risk 100% Satisfaction Guarantee if you for any reason do not feel MSM is helping you. At Kala Health we stand behind every product we manufacture for our customers.